President Obama’s recent veto of the Keystone XL pipeline bill, a measure Manchin strongly supported, only poured salt on the wound. “Oh, hell, I didn’t think it could get any worse,” he said upon learning of the veto. Manchin, a moderate Democrat interested in energy and economic issues, says Washington paralysis is so bad he’s considering heading back home to run for his old job in the governor’s mansion next year rather than seek Senate re-election in 2018. He has told reporters he would decide by this summer. But would a return to Charleston make sense politically? -- Would staying in Washington or winning a third term as West Virginia governor be most beneficial for the Democratic Party, from both a national and state perspective? -- Does a West Virginia Democrat have a better chance at an open gubernatorial or senatorial seat? -- In which office would Manchin be able to advance his policy goals more effectively? Our analysis shows mixed results, leaving the political aspect of Manchin’s choice murky. What makes the most sense for the Democratic Party? On a state level, if Manchin runs for governor, he potentially does a big service to the Democratic Party in West Virginia. He has high name recognition and a solid 45 percent to 31 percent job approval/disapproval rating in the most recent public poll in August. While the state Democratic Party has a reasonably deep bench, Manchin is well-liked, well-known, accomplished and experienced. He would likely clear the field in the Democratic primary and would be the early favorite to win the general election. But even if he won, a third Manchin term in the governor’s mansion could create problems for the national Democratic Party. Not because of anything he might do there—but because he wouldn’t be in the Senate any longer. It is impossible to know which party will control the Senate after the 2016 or 2018 elections, but there are plausible scenarios in which one party has only a razor-thin edge over the other. If Senate Democrats have a thin majority or a near-majority in the Senate, they may not want to risk a seat by running anyone other than Manchin in West Virginia. By that logic, if Manchin stays in the Senate, the national party benefits. Democrats want to regain and then maintain control the upper chamber, and a strong incumbent Democrat from West Virginia helps them achieve that goal. Conversely, if Manchin chooses to stay in the Senate, he may create problems for state Democrats. If a Republican were to win the 2016 gubernatorial election (Sabato’s Crystal Ball rates the race as a tossup if Manchin passes on it), that governor would likely be greeted by friendly majorities in both houses of the state legislature. Even if 2016 is a good year for Democrats, the Republicans’ majority in the state’s House of Delegates – 64 of 100 seats – is massive and may be tough to reverse. And although their edge in the State Senate is thin (18 to 16), most members of the Republican caucus (11 of the 18) are not up for re-election until 2018. To sum up: if Manchin stays in the Senate, there is a solid chance a Republican could win the gubernatorial election and be able to easily enact his or her agenda with the backing of Republican majorities in the state legislature. If Manchin leaves the Senate, he decreases the odds of Democrats regaining and maintaining control of the chamber in the coming years. Which is tougher for a West Virginia Democrat to win – a U.S. Senate seat or the governor’s mansion? To those familiar with West Virginia political history—and it’s my home state—this might seem an odd question. Democrats have dominated both offices for decades. Only two Republicans – Arch Moore and Cecil Underwood – have won the governorship since the 1930s, and Democrats won every Senate election in the Mountain state from 1958 to 2012. In the 2000 presidential election, however, George W. Bush won the state by emphasizing his pro-coal and socially conservative views, kicking off a pro-GOP trend in West Virginia. But this trend has been uneven across different levels of government. West Virginia’s congressional delegation has gone from entirely Democratic to nearly entirely Republican in the last 16 years. Since 2000, Republicans have flipped all three of the state’s House seats, and in 2014 Republican Shelley Moore Capito won a Senate seat – leaving Manchin the only Democrat in the state’s congressional delegation. On the other hand, Democrats have won every gubernatorial election since 1996. 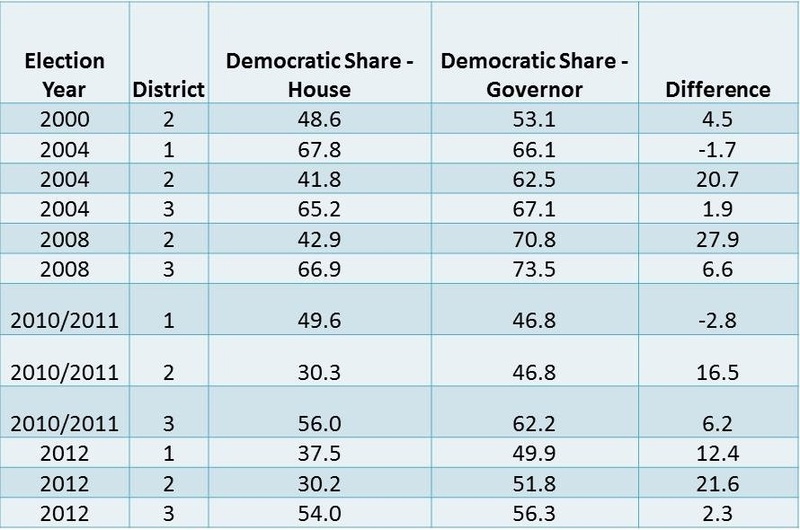 The table compares the Democratic share of the major two-party popular vote in the contested 2000, 2004, 2008, 2010 and 2012 congressional elections to the Democratic gubernatorial candidate’s share. Note that in nearly every case the difference is positive, which shows that the Democratic gubernatorial candidate typically kept pace with or outran his party’s congressional candidate. This is an imperfect measure, but it lends some support to the idea that a West Virginia Democrat might have an easier time running for governor than senator or congressman. Even though a West Virginia Democrat might find it easier to win a gubernatorial election, strategic thinking might nudge Manchin toward staying in his Senate seat. The logic here is slightly counterintuitive: at this point (very early in the 2016 cycle) Manchin would be the favorite if he entered the gubernatorial race, but he also probably has a better shot at keeping his Senate seat than any other Democratic candidate would have at an open seat. So if Manchin thinks he can win either, he (or national Democratic Party leaders) may want to leave the comparatively easier task – winning the governorship – to a weaker politician and thus increase Democrats’ odds of keeping both the Senate seat and the governor’s mansion. Where would Manchin be able to accomplish the most? This is the most speculative question of the three. If Democrats gain seats and have either a thin minority or majority in the U.S. Senate in January 2017, Joe Manchin could become a dealmaker. It’s not hard to imagine him giving either side a decisive vote on a key bill in exchange for influence over the legislation. On the other hand, if either party has a dominant majority, Manchin will have less leverage. And if Congress remains gridlocked, he remains frustrated. If Manchin returns to the governor’s mansion, he may not be able to accomplish as much as he did in his first two terms. Manchin worked with massive Democratic majorities in both state chambers for his entire tenure as governor from 2005 to 2010, and the new Republican-controlled state legislature may be less cooperative. Some of these problems might disappear if Manchin switched to the Republican Party. As a Republican governor, he might face a friendlier state legislature in 2017, and as a moderate Republican senator, he could still act as a dealmaker. In fact, had Republicans won only a thin majority or near-majority in the upper chamber last November, then-Senate Minority Leader Mitch McConnell likely would have attempted to convince Manchin to switch parties. Manchin has repeatedly thrown cold water on such speculation, however, and, Aaron Blake points out in The Washington Post, party switching often leads to burned bridges with the original party, mistrust in the new party, and problems in future elections (former Florida Gov. Charlie Crist and former Pennsylvania Sen. Arlen Specter serve as cautionary tales here). Even if Manchin keeps his word and sticks with the Democratic Party, in other words, he faces a tough choice.